OutstandingIt felt like I was being prayed for every night. For one that is always praying for others that is such a blessing! So relate too each day short yet effective one of the best parts of my day! Filled with beautiful images, scripture and short poetical encouragement, "Blessings for the Evening: Finding Peace in God's Prescence" by Susie Larson, is a mixed, topical based devotional book, that makes a great gift for those who are going through hard times and needing a little "pick me up".The photography that is used to illustrate Sue's short but lyrical words, almost jumps off the pages as they are turned, and helps draw the reader in a visual comfort of beauty that highlights this unique devotional.Ranging from more direct topics such as grief, to more general subjects titled for exampled, "Rest for the Weary", I enjoy this visual book that is clearly designed to be visually, spiritually and mentally uplifting for the reader and the receiver of this gift.Not designed to be read through, but clearly designed for a burst of encouragement when needed, I can see this as a wonderful treat to add to a gift basket or simply to just have or to give to someone, in times when comfort and just encouragement is needed.The photography perfectly suits the scriptures that are posted on the left side of the book, while Susie words are gentle and feels like a comforting short note from a friend, saying, "You can and will get through this".For myself, as I went through the book, when I wasn't mulling over the visually powerful images that highlighted the page's topic, I felt drawn in by Susie's words and through the 90 topics that are shared, and simple but powerful words on each page, this is a book to be cherished, to be shared and to have beside the bed for those evenings when God's presence and peace is sought.Everything about the design and how the book is put together has one set goal...to draw in the weary and the burdened and lift them up with a sense of hope and peace that is sought after so dearly and this book accomplishes that very goal.It was a joy and delight perusing through the pages and admiring not just the frame worthy photos but the perfect accompaniment of words of care and love and scripture. 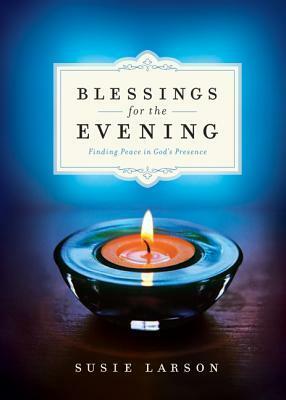 Blessings for the Evening by Susie Larson (Bethany House, 2013) is a rather lovely looking gift book-sized devotional. With just a simple one-page introduction, the author leads the reader directly into Scripture and calm, soothing devotions. With about 90 devotions, each two-page spread includes a Scripture excerpt on the left side and a brief devotion on the right side. These devotions read like prayers and have a blend of simplicity with attention-getting truths. The author ends almost every devotion with a phrase that includes “rest” or “sleep well” or “blessed sleep,” and the reader can almost hear the prayers spoken in a soothing voice. Some of the devotion titles include “Tomorrow’s Promise,” “Through God’s Eyes,” and “Glimpses of Glory,” along with specific devotions for special circumstances like Christmas, spiritual warfare, disappointment, and more. While these devotions don’t pose deep theological questions, they do bring attention to inner reflection and, even more, reflection on God and His ever-present care.The book’s design adds to the gift appeal of this book because each page’s background boasts a beautiful evening landscape photo (rather than just plain paper). These gorgeous photos add to the relaxing personality of the book. Not intended to take the place of your Bible study, this devotion provides a good supplement to your personal study and a way to wrap up the day returning your focus to God.Disclosure: I received a copy of this book free from the publisher (Bethany House) in exchange for my honest review. All opinions expressed are my own. This is a Beautiful, Gift quality book of encouragement. It has beautiful pictures on every page as a back drop to the words of life. There is scripture on one side and a short prayer-like encouragement on the other. At the back of the book are some other specific encouragements that are aimed at Grief, Disappointment and Christmas, just to name a few .What an awesome way to spend a few moments and quiet your soul before bedtime. I first became aware of the author, Susie Larson, when I found her site on Facebook and still visit her page often.When her book, came up as a choice to read for review, I was quick to snap it up. It didn't disappoint. I plan on "gifting" this to a friend, who I know will enjoy it as much as I did. I plan on remembering this book for Christmas, Birthdays and other special days of friends and family. I received a free copy of this novel from Bethany House Publishers as part of their book review program, and I am under no obligation to write a positive review. When I first received it, the cover was appealing and I couldn't wait to see what was between the covers. I love that there is a bible verse, and then a short one page reflection that just leaves you with a peaceful feeling. I thought the pictures on the pages were relaxing and peaceful as well. What a well planned out book that would be a great gift for any person that you love! This book is a wonderful addition to my devotional/reflection books. I don't always have time to spend a lot of time in devotions at the end of the day, especially at the end of a busy day. This book was just the key - it was brief, relaxing, and the message on the pages really were great reminder of the promises of God. I love that at the end of most pages it reminds you to "sleep well." I received a complimentary copy of this book in return for my honest opinion. The opinions shared in this review are soley my responsibility. This is a beautiful book! The pages are loaded with pictures of nature, people and animals.The pictures are bright and colorful and then the words are printed "on top" of the pictures.This is not a sit down and read it type of book. It's more of a short.put.your.mind.to.rest type of book. It's a relaxing book.There are prayers, scriptures and short/very short devotionals. It's not a deep book and therefore, it makes for a great before I go to sleep read.I love all the pictures but one of my faves is on page 111. There is a beautiful picture of a sunset with a long walk out to a lake. It is entitled, Purpose in Every Step. This is a great encouraging "read. "I'm going to give this book as a get well card to those who need encouragement when they are ill.It would also make a great gift! I gave this book to my mother last month while she was in the hospital for brain cancer before she was released for hospice to succumb to her death only 2 weeks later. After the memorial, my sister discovered Mom had painstakingly written her sister's initials on a handful on the pages ... as her prayers offered for them. Although I have not read the book myself, cover to cover, I am struck knowing this was the last book my mother ever read and that she was moved to pray for her unbelieving sister and bro in law through it.Thanks to the author for blessing our mother through the pages of your beautiful work. Grateful. Blessings for the Evening was a great book! Every night I have read one of the "blessings" that are in the book. Each and everyone of them spoke to my heart when I read them. Susie Larson definitely is great at taking Bible verses and putting a devotion with them that helps with everyday life. I looked forward to reading each of the blessings every night with my daily bible reading before I went to bed. I give this book a 5 out of 5 stars.I received this book in exchange for my honest review from Bethany House Publishers. I love all things Susie Larson! I was excited to read this book. I was not so excited to find out that this was a scripture book instead of the Christian Education book that I thought it would be. But alas! This was still a good read. The scriptures were all true to the Word, and the format for displaying the scriptures was beautiful. The prayers (like all of Susie Larson's written prayers) were powerful and awe inspiring.The prayers were my favorite part. This book was estheticalliy beautiful. I would read it again as a quick reference for finding scriptures. I got this book from Bethany House for review. No, they didn't pay me... but yes, I do love it. This amazing book will inspire you, lift you up, and remind you that God is there. It is beautiful, and the perfect book to gift, as well! One of my favorite devotionals! So positive and uplifting. Highly recommend! Great Book!This is a smoothing book to read before going to bed. It's simple with Holy Scriptures to you to think on. Hated to see the book ends. I started read these blessings to my husband every night before bed shortly after he was diagnosed with cancer. It was amazing how much they blessed us each night. Words of wisdom and prayerTruly a good book to refocus your mind on the goodness of God! A great source for prayer and to calm your mind as you prepare for restful sleep. Susie Larson - Susie Larson hosts a daily radio talk show that airs across the upper Midwest and contributes a weekly feature heard nationally on Moody Radio. Active in local ministry as well as International Justice Mission, she has authored six previous books and been a guest on national TV and radio programs, including Focus on the Family. Susie and her husband, Kevin, have three adult sons and live near Minneapolis, Minnesota.